Joseph Andrew Ross...Attended Bishop O'Dowd High School in Oakland, Calif...Went 5-4 with a 0.92 ERA during his senior season... Committed to play baseball at UCLA before signing with the San Diego Padres following the 2011 First-Year Player Draft...Older brother, Tyson, has appeared in 196 Major League games for Oakland (2010-12) and San Diego (2013-16, 2018), Texas (2017) and St. Louis (2018). Made his return to the mound after rehabing from "Tommy John" ligament replacement surgery in July 2017...Began his rehab outings on Aug. 6 and returned to active roster on Sept. 4....Made six rehab starts, going 2-1 with a 2.39 ERA between the Gulf Coast League, Single-A Potomac, Double-A Harrisburg and Triple-A Syracuse...His first Major League start of the 2018 season came on Sept. 13 vs. New York (NL)...He threw 5.0 IP of two-run ball, giving up four hits and walking two...Made his final start of the season on Sept. 28. Had his third season in Washington cut short after undergoing "Tommy John" ligament replacement surgery in July...Made his final start of the season on July 9 vs. ATL...In previous four starts, was 2-1 with a 2.36 ERA (7 ER/26.2 IP), 22 strikeouts and eight walks...Struck out a career-high 12 batters on June 8 vs. BAL...Matched a career high with 8.0 innings on May 23 vs. SEA (8.0 IP, 5 H, ER, 6 SO)...Opened the season by receiving 62 runs of support, the most in MLB history through a pitcher's first four starts of the season, per Elias ...His 10.14 average run support would have been first in MLB, if qualified...Opened the season with Triple-A Syracuse, but was recalled on April 19...Was optioned to Triple-A Syracuse on May 1 before being recalled on May 23. Began the season in Washington's rotation before being placed on the disabled list on July 3...Missed 66 games due to right shoulder inflammation...Posted a 2.79 ERA (3 ER/9.2 IP) with 14 strikeouts against just three walks in three games after reinstatement on Sept. 18...Posted a 19.2 scoreless innings streak from April 10 to April 30, the longest of any Washington pitcher and 13th-longest in the NL in 2016...Struck out 28 batters against just four walks (7.0 strikeout-to-walk ratio) over his five starts prior to his DL stint...Surrendered a home run to Nick Castellanos on May 10 vs. DET, the first home run he had allowed in 160 at bats, a streak that dated to August, 2015...He entered that game as the only qualified (3.09 batters faced/team game) starting pitcher in MLB to not allow a home run to that point in 2016, and, via the Elias Sports Bureau, his 160 at-bat streak was the third longest in MLB at that time behind only CIN's RHP Blake Wood (174 at-bats) and BOS's RHP Carson Smith (172 at-bats)...Ross made his first Postseason appearance, starting Game 4 of the NLDS at Los Angeles. In first season in Washington's system, started at Double-A Harrisburg before having his contract purchased on June 6 and made his MLB debut that day vs. CHI (5.0 IP, 6 H, 3 ER, 4 SO)...Solidified with his next two starts, June 13 at MIL (8.0 IP, 7 H, 2 R, 2 ER, BB, 8 SO) and June 19 vs. PIT (7.1 IP, 6 H, R, ER, BB, 11 SO)...With that 11 K effort, Ross became just the third rookie to strike out at least 10 batters in a game in Nationals history, joining RHP Stephen Strasburg (14 - 6/8/10; 10 - 6/18/10) and LHP John Lannan (11- 4/7/08)...Allowed three or fewer earned runs in his first seven career starts, tying LHP Micah Bowie (7 GS, 5/20-6/22/2007) for the second-longest such streak by a starting pitcher to begin a career in Nationals history (2005-present)..Made 13 starts before moving to the bullpen for the final three weeks of the season...Ranked among National League rookie starting pitchers (min. 13 GS) in on-base percentage (2nd, .280), WHIP (3rd, 1.11), fewest walks (4th, 21), strikeout-to-walk ratio (5th, 3.29) and strikeouts per nine innings (8th, 8.10)...Set a Nationals record (2005-present) by starting his career facing 51 consecutive batters before issuing his first walk (June 13 at MIL - A. Lind)...Prior to Yasiel Puig's home run on August 11 at LAD, Ross faced 100 right-handed batters before surrendering an extra base hit...Right-handed batters hit just .172 (26-for-151) with one double, one triple, three home runs, 14 RBI, six walks and 42 strikeouts... When promoted, Ross ranked among Eastern League pitchers in ERA (T10th, 2.81) and strikeouts (4th, 54)...His 54 strikeouts led Washington Minor Leaguers while his 2.81 ERA was good for fourth...Was rated by Baseball America as the No. 8 prospect in the Eastern League following the season... He entered the season rated as the No. 96 prospect in all of baseball...Prior to being traded to the Nationals, was rated by Baseball America as the No. 4 prospect in San Diego's chain. Spent the entire season with Single-A Fort Wayne making 23 starts and being named to the Midwest League All-Star team...Held opposing hitters to a .186 (8-for-43) average and no home runs with runners in scoring position and two outs...Following the campaign, was ranked as the Padres' No. 10 prospect and the Midwest League's No. 14 prospect by Baseball America. Opened the year at Single-A Fort Wayne, also making starts with the Rookie-Level Arizona Padres and at Short-A Eugene...Entered the season ranked as the No. 10 prospect in the Padres organization by Baseball America. Made just one relief appearance for Rookie-Level Arizona in his fi rst professional season. 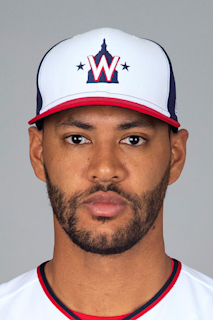 April 7, 2019 Washington Nationals recalled RHP Joe Ross from Fresno Grizzlies. March 23, 2019 Washington Nationals optioned RHP Joe Ross to Fresno Grizzlies. September 4, 2018 Joe Ross roster status changed by Washington Nationals. August 27, 2018 Washington Nationals sent RHP Joe Ross on a rehab assignment to Syracuse Chiefs. August 22, 2018 Washington Nationals sent RHP Joe Ross on a rehab assignment to Harrisburg Senators. August 16, 2018 Washington Nationals sent RHP Joe Ross on a rehab assignment to Potomac Nationals. August 6, 2018 Washington Nationals sent RHP Joe Ross on a rehab assignment to GCL Nationals. November 3, 2017 Washington Nationals activated RHP Joe Ross from the 60-day disabled list. July 16, 2017 Washington Nationals transferred RHP Joe Ross from the 10-day disabled list to the 60-day disabled list. July 14, 2017 Washington Nationals placed RHP Joe Ross on the 10-day disabled list retroactive to July 11, 2017. Right elbow sprain. May 23, 2017 Washington Nationals recalled RHP Joe Ross from Syracuse Chiefs. May 1, 2017 Washington Nationals optioned RHP Joe Ross to Syracuse Chiefs. April 19, 2017 Washington Nationals recalled Joe Ross from Syracuse Chiefs. April 2, 2017 Washington Nationals optioned RHP Joe Ross to Syracuse Chiefs. September 18, 2016 Joe Ross roster status changed by Washington Nationals. September 2, 2016 Washington Nationals transferred RHP Joe Ross from the 15-day disabled list to the 60-day disabled list. Right shoulder inflammation. August 27, 2016 Washington Nationals sent RHP Joe Ross on a rehab assignment to Syracuse Chiefs. July 30, 2016 Washington Nationals sent RHP Joe Ross on a rehab assignment to Syracuse Chiefs. July 24, 2016 sent RHP Joe Ross on a rehab assignment to Hagerstown Suns. July 3, 2016 Washington Nationals placed RHP Joe Ross on the 15-day disabled list. Right shoulder inflammation. July 21, 2015 Washington Nationals recalled RHP Joe Ross from Syracuse Chiefs. June 23, 2015 Washington Nationals optioned RHP Joe Ross to Syracuse Chiefs. June 6, 2015 Washington Nationals selected the contract of Joe Ross from Harrisburg Senators. December 19, 2014 San Diego Padres traded RHP Joe Ross and Player To Be Named Later to Washington Nationals. December 19, 2014 RHP Joe Ross assigned to Harrisburg Senators. September 26, 2014 San Antonio Missions activated RHP Joe Ross from the 7-day disabled list. August 12, 2014 San Antonio Missions placed RHP Joe Ross on the 7-day disabled list. July 16, 2014 RHP Joe Ross assigned to San Antonio Missions from Lake Elsinore Storm. April 3, 2014 RHP Joe Ross assigned to Lake Elsinore Storm from Fort Wayne TinCaps. January 23, 2014 San Diego Padres invited non-roster RHP Joe Ross to spring training. September 12, 2012 RHP Joe Ross assigned to Fort Wayne TinCaps from Eugene Emeralds. August 24, 2012 Joseph Ross assigned to Eugene Emeralds from Fort Wayne TinCaps. June 30, 2012 AZL Padres sent RHP Joseph Ross on a rehab assignment to Eugene Emeralds. June 28, 2012 Joseph Ross assigned to AZL Padres. May 9, 2012 Joseph Ross roster status changed by Fort Wayne TinCaps. March 31, 2012 RHP Joseph Ross assigned to Fort Wayne TinCaps from AZL Padres. August 28, 2011 Joseph Ross assigned to AZL Padres from San Diego Padres. August 15, 2011 San Diego Padres signed RHP Joe Ross.